It's the longest hiking trail in the United States, stretching over seven states from New York to North Dakota. It's the 4,600 mile North Country Trail, created in 1980, with 1,000 miles running through Michigan. The Spirit of the Woods Chapter is responsible for maintaining the 78-mile section of the North Country National Scenic Trail which passes through the Huron-Manistee National Forest. As the trail exits Ohio and enters southeastern Michigan, it veers toward the western side of the state. Entering the Manistee National Forest between Big Rapids and New Era, it continues its northerly path west of Baldwin, east of Manistee and south of Traverse City. It continues up past Harbor Springs, Petoskey, Mackinaw City...and traverses the entire Upper Peninsula before crossing into Wisconsin. 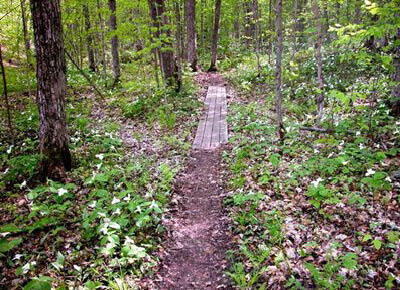 The North Country Trail is primarily for hikers, where you can experience the beauty of the Manistee National Forest. Here you're surrounded by pine hardwood trees and are treated to great views along the Manistee River Trail. Spring, summer and fall are when hikers and bikers populate the trail. During the winter, you'll find cold weather sports enthusiasts who use the trail for cross country skiing and snowshoeing. You can find more information about the North Country Trail on the Spirit of the Woods Chapter of the North Country Trail website. This chapter regularly holds hikes and work sessions to maintain the trail. 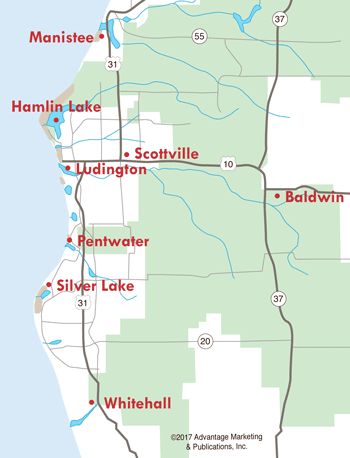 Read more about the Northern Michigan section of the North Country Trail.